Born out of necessity in 1990,to rescue members of the RAC and AA who had lost there keys, my company has developed over the years into its present format. 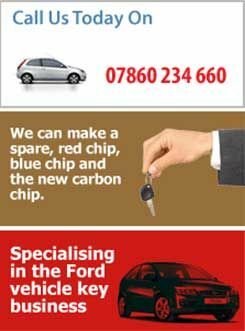 We now operate a service which specialises in replacing lost keys for Fords and spare keys for Fords. We operate our mobile service in Hampshire, Surrey, Berkshire, London, Middlesex, Kent and Oxfordshire. Due to the complex nature of modern key transponder chips, we decided many years ago that it would be untenable to try and cover the enormous market of the car industry, there are just so many manufacturers to cover. As such we took a decision to stick with one make that being Ford. 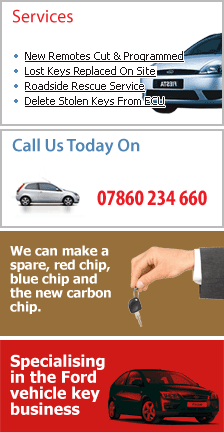 We regularly turn up to a Ford motor vehicle which has No keys ,we cut the required key without knowing the key number ,programme the “chip" part of the key, which is the immobiliser into the cars computer, all within 15 minutes. We operate on a fixed pricing system, our customers know what they will pay before we arrive at the roadside to assist them.